In Greek mythology, Aquila is Zeus’ loyal servant—a majestic eagle renowned for his sight. Nothing escapes Aquila’s vision. And that’s why we chose him as our company’s namesake and inspiration: Like Aquila, we see everything happening in our corner of the world. AQUILA is a full-service commercial real estate firm serving owners, tenants, developers and investors in the Austin metro area. But like most great tales, AQUILA’s story begins with a problem. In 2007, Austin’s commercial real estate market was being dominated by behemoth national firms that didn’t understand the city. More focused on their bottom lines than their clients, these companies were leaving countless deals on the table. At a former company, I wanted to create a database to better understand the market—and to directly benefit the owners and properties we represented. So I proposed we hire interns—University of Texas students—who would “walk” the properties. Visit every site. Take photos. Check occupancy. Then report back to me. Seems like an obvious, easy thing to do, right? After months of trying to navigate the bureaucracy, I gave up. There would be no interns for us. So Bart and our five other co-founders joined forces to form AQUILA—a new kind of real estate company that would be agile, hard-working, and overwhelmingly Austin. While AQUILA was founded as a brokerage, our quick success led to new opportunities to expand our services. 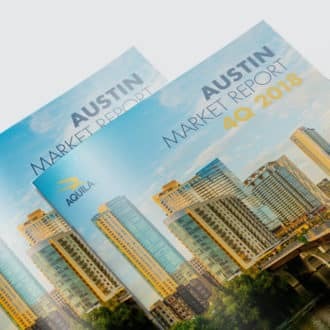 Today, AQUILA is Austin’s premier full-service commercial real estate firm—offering tenant representation, property management, project leasing, project management and more.